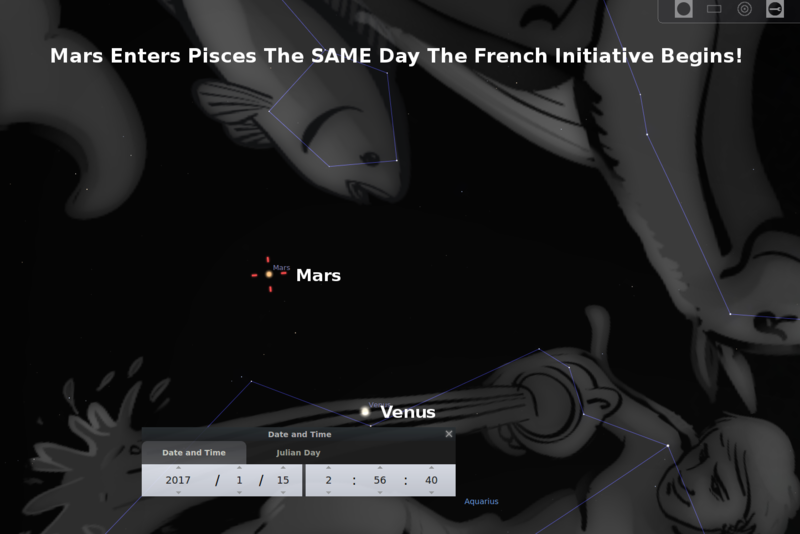 Mars and Venus Enter Pisces seven days apart. How could a peace treaty be symbolized in the stars? How about Mars (war) and Venus (peace) coming together! Pisces (Fishes) represents the nations (as the 153 fishes in John 21:11). Seventy* nations will be gathering in France to discuss the Israeli-Palestinian conflict on January 15, 2017 . There is a great deal of concern that the principles agreed upon at that conference will form the basis for a UN Security Council resolution that will be rushed to a vote before President-elect Donald Trump is inaugurated on January 20, 2017. *Note: God originally established seventy nations plus Israel. Now seventy nations are conspiring against Israel. Mars (war) enters Pisces (representing the Nations) on January 15, with Venus (peace) trailing by 5 degrees (7 days). I believe that a peace treaty is represented by the conjunction of Mars and Venus (war and peace coming together). The next time the two planets actually come together is when Venus eclipses Mars on October 5, 2017, in the constellation of Leo (representing the Jews). *Note: This is not the first time that we have seen a significant “Peace” event occur when Mars and Venus converge. See Venus/Mars Close Approach on February 22, 2015, when the US/Iran nuclear deal was instigated. Do you want to see what happens when you make God really mad? . . . Stay tuned . . . .
Barack Obama stabbed Israel in the back on Friday, and now John Kerry has slapped Israel in the face just five days later. And that’s the bottom line: the vote in the United Nations was about preserving the two-state solution. That is why we decided not to block the UN resolution that makes clear both sides have to take steps to save the two-state solution while there is still time. Principle six: End the conflict and all outstanding claims, enabling normalized relations and enhanced regional security for all as envisaged by the Arab Peace Initiative. It is essential for both sides that the final status agreement resolves all the outstanding issues and finally brings closure to this conflict, so that everyone can move ahead to a new era of peaceful coexistence and cooperation. FIVE Days Before Trump Is Inaugurated Obama WILL Do This… and It CAN’T Be UNDONE!